Born in 2006 at IMCCE Observatoire de Paris, the European Near Earth Asteroid Research project (EURONEAR) aims to grow the European contribution in studying of Near Earth Asteroids (NEAs). Our first aim has been to ameliorate the NEA orbits via astrometry derived from new observations and archive data mining, while another more recent aim is to study physical properties of NEAs via photometry and spectroscopy. Fifteen telescopes (from 30cm to 4m diameter) accessible to the EURONEAR network from Spain, Chile, France, Romania and Germany have been used for NEA observations, including since 2009 the 2.5m diameter Isaac Newton Telescope (INT) endowed at its prime focus with the relatively wide field mosaic camera WFC (34x34 arcmin field), the INT is a very good facility to recover important NEAs not observed for years, as faint as limiting magnitude R~23.0, beyond the limit of the current NEA surveys. Besides follow-up work which succeeded in improving about 1500 NEA orbits during the last 8 years via EURONEAR, some important incidental survey work has been carried and published thanks to the involvement of many amateur astronomers and students working mostly remotely who carefully blinked thousands of CCD images to search and measure all moving objects using the Astrometrica software written by Austrian amateur astronomer Herbert Raab. Together, a few thousand orbits of known main belt asteroids (MBAs) falling in the observed fields have been improved, while a few other thousand unknown MBAs have been reported by EURONEAR using mostly three telescopes, namely the INT 2.5m from La Palma, ESO/MPG 2.2m and Blanco 4m from Chile. Among the unknown moving objects, about 20 became best NEA candidates, unfortunately lost mostly due to lack of any follow-up telescope time. This situation was improved in the semester 2014A, when Dr. Ovidiu Vaduvescu (EURONEAR founder, ING astronomer, IAC and IMCCE associated) was awarded by the Spanish time allocation committee 30 hours INT target of opportunity (ToO) time for recovery of important NEAs (one opposition fainter objects less accessible to major surveys) and rapid follow-up of important new NEAs and eventual discoveries. Part of this C136 program carried out in a team comprising a few amateurs and students mostly from Romania and the ING, during 1 hour of the 1/2 June 2014 night the ING student Vlad Tudor observed a few fields with the aim of recovering four important NEAs. In one of the observed fields, the amateur astronomer Lucian Hudin based in Cluj Napoca, Romania, identified and measured a few other unknown asteroids among which the faint R=21.6 magnitude object baptized EUHT171 was clearly detected at signal to noise S/N=6 in good conditions (dark and clear night with good INT seeing 1.2"). Moving faster and in a different direction than all other main belt objects in the field, he could flag immediately EUHT171 as a very probable NEA (score 100%). We include in Figure 1 an animation of the discovery frames (field 6.5'x5' in normal sky orientation) marking the 2014 LU14 NEA (in red circle) in comparison with the known main belt asteroid (7204) Ondrejov (marked with a green circle) moving slowly and in a different direction. Figure 1. Movie made of 6 frames where NEA 2014 LU14 can be easily spotted. Credit: Lucian Hudin. [ animated GIF ]. Thanks to the extremely rapid data reduction by the observer student Vlad Tudor (in almost real time) combined with the very fast and keen visual detection and accurate measurement and classification of all moving objects by amateur astronomer Lucian Hudin, after only 3 hours we reported this finding to the Minor Planet Centre (MPC) as "New NEO Candidate (EUHT171) from 950 - La Palma while recovering 2012 MR7". Although this object was rapidly posted on the MPC NEO confirmation list during next four days, no other observatory could recover it, thus during the following few nights using same ToO time, we recovered the object and promptly reported the astrometry data to MPC. Finally, following five nights astrometry of EUHT171 collected during one week, the MPC linked all our 31 observations in a NEA orbit and assigned the number 2014 LU14 to EUHT171, these findings being published in the MPS 518060 and MPEC L49 circulars. 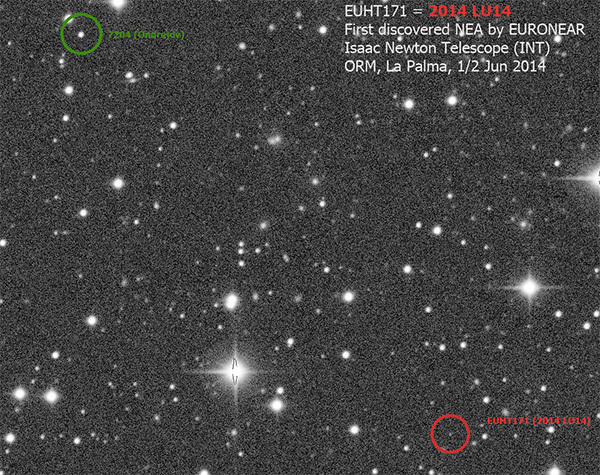 Thus, EUHT171, now officially known as 2014 LU14, became the first NEA discovered and secured by EURONEAR, the first NEA discovered from La Palma, the first NEA discovered using the INT and also the first NEA discovered by three astronomers of Romanian origin, thanks to an excellent collaboration between professionals, amateurs and student astronomers and to the Spanish ToO time. 2014 LU14, one of the ~10,000 NEAs known today, thanks to five major American surveys, is an Apollo NEA which resides quite close to the Earth orbit (semi-major axis a=1.29 AU, minimum orbital intersection distance MOID=0.197 AU) revolving around the Sun every 1.5 years in an elongated orbit (eccentricity e=0.45) quite tilted with respect to the Earth equator (inclination i=25 deg). Figure 2 shows its orbit and position at discovery in relation to the Earth and other planets. Having an absolute magnitude of H=18.6, the discovered NEA has an estimated size of about half a kilometer (assuming a mean albedo of 0.2), and will become better visible in July 2014 (estimated magnitude V=20). Figure 2. Orbit of NEA 2014 LU14. Credit: NASA/JPL NEO program. [ GIF ]. Besides Ovidiu Vaduvescu (ING, IAC and IMCCE associated), the whole team comprises Vlad Tudor and Teo Mocnik (ING students), Lucian Hudin (amateur astronomer, ROASTERR-1 Observatory, Romania), Andrei Marian Stoian (amateur astronomer, Schela Observatory, Romania), Stefan Mihalea (amateur astronomer, SARM Romania), Farid Char (Universidad de Antofagasta, Chile), Mansour Karami (IPM and BA Tehran and former ING student), Javier Licandro (IAC and ULL, Tenerife), Alexandru Tudorica (PhD student, Bonn), Marcel Popescu (Astronomical Institute of the Romanian Academy and IMCCE Paris) and Ruxandra Toma (PhD student Armagh Observatory and SARM Romania). 2014 LU14 at the IAU Minor Planet Center. Summary of PHA and NEA Discoveries by Discoverers, showing that 2014 LU14 is the first NEA discovered at station 950, La Palma. For more information please contact Ovidiu Vaduvescu (ovidiuv ing.iac.es).